This article outlines ways by which you can fill your web pages with great and compelling content to synergize with SEO and all other digital marketing efforts. The most important component of your website is the content. While a visually appealing website is great, it won’t motivate visitors to take any action. It is the content of your website that will make them take the right action. So, it is necessary to focus on the content of your website. Always make use of active voice as it is more effective than passive voice. Always use 2nd person pronoun to make the information personal. Your content will make more sense when you address the reader directly. It also indicates empathy to an extent. A lot of websites talk a lot about all the extra efforts they have been making. They talk about how hard they work and how far they have gone. Unfortunately, they forget to tie everything to any benefits to readers and customers. Remember that when people go through online content, they are actually searching for what is in it for them. Now, this is going to sting a little bit but it is the truth. Nobody really cares how hard you worked if it is not to their benefit. So, let them know what your hard work means to them. Check the two sentences below. A. We have been working hard to improve our website. B. We have been working hard to create shortcuts on our website so that you can locate the product you are looking for faster and easier. Which one do you think will make sense to readers and customers? Of course it is the second and longer sentence. This is because readers’ benefit was tied to the hard work. So, in your content, always include benefits to readers in everything you talk about. The content of your website is meant to inform visitors and not to oppress them right? So, why use big words when there are simpler words. If you run into what looks like an interesting 500-word article and decided to read it. What will you do if the first paragraph alone has sent you to your dictionary thrice? You will definitely drop off. That is not a good experience at all. That is exactly how readers feel when you make use of big words in your content. On the other hand, it can also become a credibility issue because some people believe that every term can be broken down into simpler words. Anybody that cannot break a particular term into simpler words does not really understand the term or he is trying to bamboozle readers. So, keep your content simple. As they say, less is more. Repeating the same thing while speaking verbally may pass for emphasis, it does not work that way in written text. After writing your content, it is important to remove all the repetitions even if they are in different words. After that, you should remove other words that do not add more to the information being passed across. Yes, you may add some words for readability. But you should not turn a 100-word write-up into 250-word article because of readability. That way, you will not only waste your own time, you will also waste the time of your readers. Save them the time that they don’t have. When marketing your products, it is better to focus on their benefits to customers and not features. Some websites waste a lot of text and space hammering on features and features and features. And they wonder why their sales don’t improve. 1. What are their benefits to users? 2. How are they superior to competitors? Those are the two points you should focus on. In fact, that is what marketing is all about. Gone are the days when you restrict your contact details to only your contact page. Now, it is better to put your contact details at the bottom of every webpage for easy access. A potential customer that intends to make enquiries about your product could just change his mind when he finds it difficult to find your phone number. To make it even easier for your prospective customers, you may also make your phone number a link. So, when the number is tapped, a call will be initiated to you. This will save customers the stress of leaving your website to call you. A clear call-to-action should also be at a conspicuous corner on every webpage. Nothing impresses customers’ more than instant response to their inquiries. This is why most of them will rather call than send an email and wait for 24 hours. It is even in your interest to respond to inquiries immediately as a sale could be concluded immediately. While waiting for your response that will come after 24 hours, the customer may change his mind or come across a better offer. So, work towards giving instant response and to facilitate customers’ decision to purchase. A good way to do this is by integrating chatbots into your website. They will man your website for 24 hours. They will respond to customers’ queries instantly and also inform them of new products or new promotional offers (if any). The chatbot will be linked to database of the answers to all the possible questions that customers and potential customers may want to ask. However, it is still possible for a customer to ask a question that your chatbot does not have an answer to. In that situation, the chatbots will present the customer with a phone number to call. This article focused on mainly the content of your website because it is more important than every other part of your website. 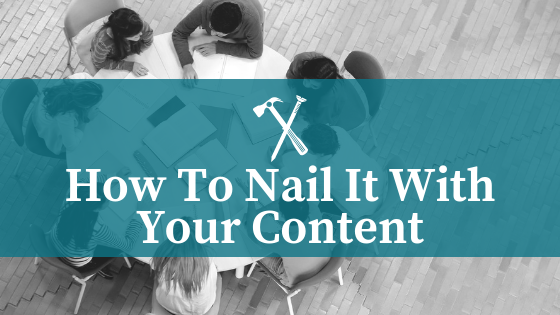 It will be quite painful to mar your marketing and SEO efforts with poor or bland content. When you adopt digital marketing strategies to bring visitors and potential customers to your site, it is important to back it up with great content.